When I was younger I got into the habit of reading every single night in bed before falling asleep. It became a ritual, something I would look forward to over the course of the day; I loved the characters and the change of scenery, and the end of each book left me longing for more. Then as I got older my social life expanded and I started reading less. Once I got to college and found myself constantly 'busy' with new people and experiences, I just stopped reading books all together. Last year I finally reflected upon this sad truth while looking at the piles of unread books on my bookcase and I made a silent goal to read at least one book per month for the whole year. And I did! 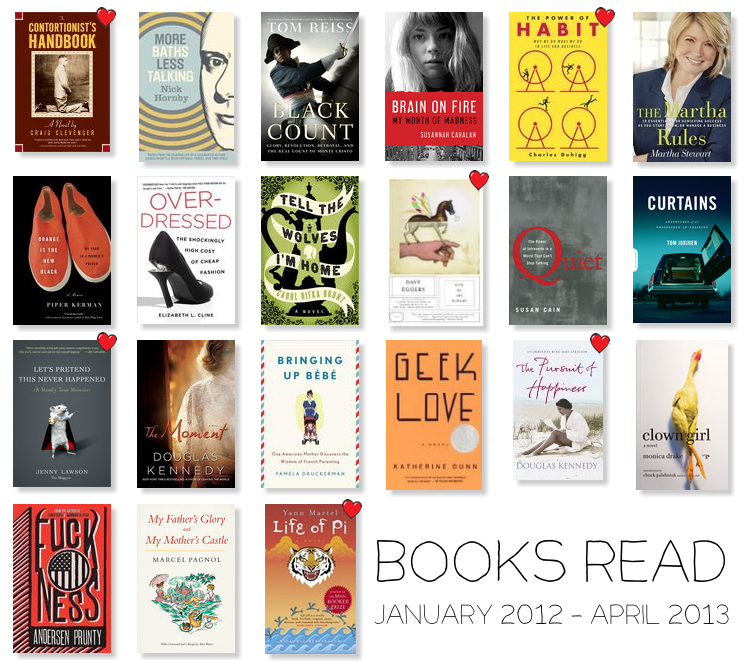 In 2012 I read 15 books. I accomplished my goal, and then some! They weren't all amazing - there were definitely some books that I liked way more than others (denoted by little hearts in my graphic below) - but the point is that I kept up with them and read way more books than I had in the last few years combined. I used to be embarrassed by my lack of reading in recent years, but it turns out that the more people I talk to about the books I've read, the more I realize that most people don't read on any sort of regular basis. Many of my friends were amazed that I even read that many books in a year- they can't remember reading anything after high school! Needless to say, I'm proud of myself. We are barely four months into 2013 and I already have six books under my belt. What has really helped me with my goal is that I get a 30-minute lunch break at work. (I don't think I've ever worked anywhere that gave me a legit required sit-down lunch break, other than Starbucks and my current employer; most places just let me eat for 10-15 minutes at a time that was convenient to stop, and sometimes I didn't even get to sit down!) So, as you can imagine, having a full 30 minutes to sit down and relax has been really helpful because I can just bring a book to work and get through a good portion of it while eating lunch. Just like when I was younger and would look forward to that half hour before bed, I now look forward to my lunch breaks (and not because I'm tired of working!). Life of Pi: A intensely beautiful story about a boy on a journey; it's about survival, beauty, and spirituality. I had started reading this in high school but never finished it, probably because I didn't understand it at the time. I know the movie came out last year as well, and although I still haven't seen it, the trailer made it appear as though they followed the story line quite closely and accurately brought to life all of the amazing adventures he describes throughout. The Pursuit of Happiness: A Novel: A few months into last year I adopted my mother's old kindle that she had passed down to my sister previously. After doing an Amazon search for free books and finding nothing to my liking, I went through the books that were already on the Kindle and I started reading this one. Only when I was about halfway through it did I realize it was one of the books I had spotted during my search and had thought "Ugh, that sounds awful!". Well, I was wrong. I'm not usually one for romances but this one got me. It's a tragic love story, but it's extremely well written and you really get to know and feel for the characters. I read another book of his a few months later which was along the same lines; he's really gifted at his genre. Lets Pretend This Never Happened: This is a book written by Jenny Lawson, a fellow blogger and natural comedian. I've never read her blog, but I really ought to because her book was hilarious. It's filled with little stories about her life, things so ridiculous you have a hard time believing they even happened. But I bet if you look back on little bits of your life, you'll find things that are just as hard to believe. This was a quick read and a worthwhile one. How We Are Hungry: I love Dave Eggars. I read You Shall Know Our Velocity while I was traveling in 2008 and I've been a fan ever since. I'm not usually a reader of short stories, but his are amazing. He has recurring characters that you'll recognize from his novels. He's also very good at describing foreign places and putting you in the moment. I think a good short story leaves you craving for more, like any good novel, but without feeling like there should be more to the story. I don't know if that makes any sense, but I do know that everyone should read at least one of his stories. The Power of Habit: I told everyone I know about this book. It makes references to popular culture that almost anyone can appreciate (football & Febreze, for example). Habits are broken down to their core and then used in real life examples. He covers individual habits, group habits, and cultural habits. There is so much information in here that you never thought you'd want to know, but it was extremely interesting and I really can't do it any justice by writing about it. The Contortionist's Handbook: Amazing. After a few months of reading nonfiction back-to-back, it was refreshing to read a novel as good as this one. It's the story of a man who changes his identity every few months; after a hard childhood he taught himself the ins and outs of the system and forges his own documents and learns how to evade authority without even raising an eyebrow. He's not a contortionist by any literal means, but the way he lives his life is very similar to what a contortionist does. The writing was honest and raw, and I enjoyed it all very much. Here's to over a year of books read! And to many more. Oooh this is inspiring to me. Now that I commute on the subway, I have approximately 45minutes of read time each day and I'm trying so hard to get back in the habit. I'm two books in and loving it. Seeing you expansive list encourages me to keep going.